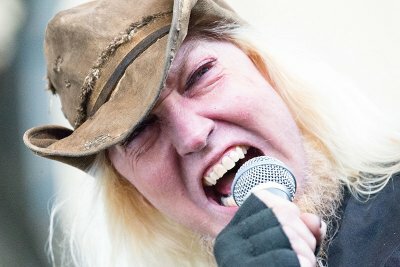 Warrel Dane, the lead singer for both Sanctuary and Nevermore, died on Wednesday (September 13) after suffering a heart attack. He was 56. Dane was in Sao Paulo, Brazil, making a new solo album. According to guitarist Johnny Moraes, who was with Dane when he had the fatal attack, "His health was already very weak because of diabetes and his problems with alcoholism. He was already facing many health problems." He want to say that "...tonight had a heart attack. It was in the flat where he stayed for the recording of the record, when it happened. I got to do cardiac massage, we called the SAMU (Mobile Emergency Care Service), who arrived very fast, but when they arrived, he had already died." Dane was actually trained for five years as an opera singer before transitioning into more popular genres. He formed Sanctuary in 1985 with Lenny Rutledge, Dave Budbill, Sean Blosl and Jim Sheppard and released their first EP the following year which brought them to Epic Records. Their first full length LP, Refuge Denied, was released in 1988 and they followed two years later with Into the Mirror Black, but neither managed to have sales big enough to chart. When Epic started to challenge the band about their sound, referencing the oncoming grunge scene, they decided to break up (1992). Around the same time, Dane and Sheppard broke off to form Nevermore. It was two years before the band had a steady lineup and, in 1995, the released their debut album Nevermore. Their second album, 1999's Dreaming Neon Black, chronicled a story similar to Dane's whose long-time girlfriend had recently disappeared. It wasn't until the band's fifth album that they finally started finding success in the U.S. Enemies of Reality (2003) went to number 11 on the Heatseakers and 19 on the Independent charts and, by their seventh and final album, The Obsidian Conspiracy (2010), they made it onto the main Billboard 200 at 132. In April of 2011, Nevermore cancelled a North American tour and, although they didn't break up, went on a hiatus so Dane could return to a reformed Sanctuary. The band recorded two new albums, 2014's The Year the Sun Died, which became their only set to chart on the main Albums list at 125, and Inception (2017). Another new album, Dead Again, was also reportedly being recorded. Dane also released one solo album, Praises to the War Machine, in 2008.